In honor of Sci-Fi Month, I’m featuring sci-fi picks for my Waiting on Wednesday posts for the whole of November. 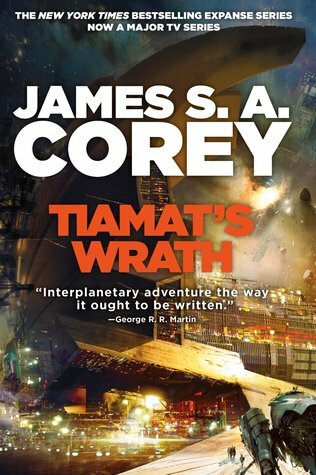 Up first is the next Expanse novel, book number 8 of 9 in this highly acclaimed rollicking space opera series. We’re coming down to the home stretch, folks. Can’t wait to see how these last two books will play out. Wow I didn’t realize this series was on book 8 already! I’ve been watching the Expanse and it is definitely making me interested in reading the books. Yeah, it feels like yesterday I was picking up the first Expanse book! I am so far behind with this series! It’s really worth picking up again! I know you were kind of iffy about the barf zombies in book one, but the series has matured since then, lol! That’s a totally new to me one! Hope you end up loving it once you get to read it! Hope you get to try it soon! I know it’s quite intimidating though, with 7 books out already and they’re all such humongous tomes! I’ve never really read any of these but I’ve heard some great things about the author. Hope you love it! They’re the writing duo of Daniel Abraham and Ty Franck, and yes, they’re awesome! One of these days…😉 Oh I am so far behind! Oh man, I am really behind on these! I picked up the first one but haven’t read it yet. I’m not even far behind – I simply haven’t started and yet I was so keen and rushed out to buy a copy of the first book. How did I fail so miserably. I’m trying to go with SF and dystopian picks this month if I can find enough I’m wanting!